The Ferry Building Marketplace is every foodie’s fantasy. There are literally dozens of fine food purveyors, especially when the farmer’s market is open on Tuesdays, Thursdays and Saturdays. There is a strategy to it; I think it is best to stroll through all the offerings before deciding what to sample. 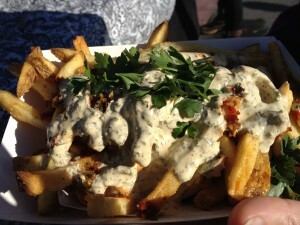 Case in point; Mj impulsively got the chimichurri fries at the 4505 Meats booth, only to notice the fried Brussels sprouts at the Namu Street Food stand next to 4505 as she waited. Luckily, she was with me and we just got both. The fries were not, for lack of a better term, chimichurrisic enough. I think we expected brighter cilantro flavor, but the fries themselves were fantastically crispy, even under the blanket of sauce. The Brussels sprouts were problematic as well; they were cut too small and the onion jam was plated on the bottom, which we did not discover until we were almost done eating. My sausage breakfast sandwich was delicious, but it is hard to go wrong with great basic ingredients. 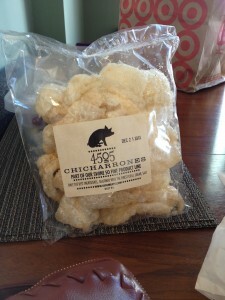 4505 also makes the best chicharrones I have ever had in my life. This is a must try if you are within a 50 mile drive of the Ferry building. 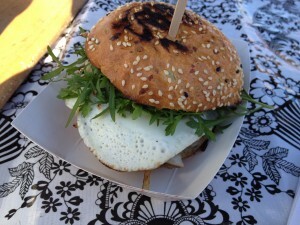 We also got porchetta sandwiches and potatoes from Roti Roti. I had this last time I was in SF and it was just as good as I remembered. I wish my porchetta was this succulent.